Just how in trouble is he? 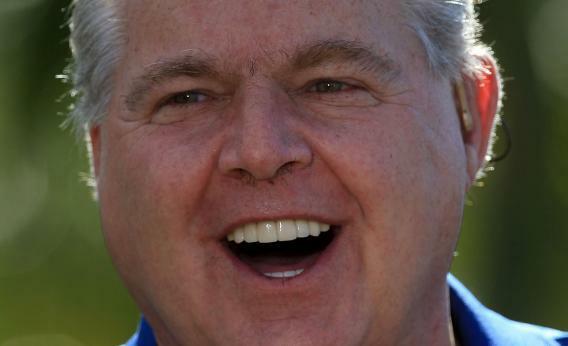 I have begun to wonder about this over the 24 hours or so, ever since rather unsavory advertisers like pro-adultery website Ashley Madison started courting Limbaugh’s show. As Torie rightly points out, these advertisers seem primarily consumed with the free advertising they can get by barnacling themselves to the Limbaugh controversy. But what if, contrary to what Medved predicts, more respectable companies continue to shy away from supporting Limbaugh’s broadcast excellence, and fringey advertisers wind up being the best Limbaugh can do? What does the flight of so many mainstream companies (like AOL, John Deere and Geico) do to his reputation? After all, Limbaugh’s popularity has long been predicated on the idea that he’s just a common-sense conservative, a guy who tells it like it is, who speaks up for the American everyman. “They want to take your ambition away from you, they want to take your dreams away from you,” he warned listeners recently of Obama and the Democratic party. In another recent show, he spoke of the failures of rampant liberalism, and imagined hordes of Americans are walking “around today in abject fear of being themselves” because they don’t want to be scolded by feminazis and “pantywaist” liberals. His message has long been that We are the normal ones; they are the abberations – those zany leftists and their co-conspirators in the media. As advertisers flee and the Ashley Madisons of the world scramble to be associated with Limbaugh, his listeners could be forgiven for wondering just how mainstream El Rushbo really is. Is he still speaking for the everyman, or is our culture increasingly relegating his kind of talk to the fringe?